Dog parks present an emerging class or urban environmental amenities. In order to develop a better understanding of dog parks, this article applies existing literature regarding urban parks and common pool resource (CPR) management to off-leash recreation areas. We develop a typology dog-park management and build upon a survey of 298 dog park users of a major dog park. We test the relationship between the perception of the park as a successfully governed CPR, and behaviour which contributes to collective action, such as contributing time, money, or to the upkeep of the park and developing a sense of community. We see strong relationships between these indicators of overcoming collective action problems and the four variables corresponding to design principles. Across all models, feeling involved in rule-making positively and significantly predicts more collective action or stronger sense of community. Nearly unheard of a couple decades ago, dog parks are perhaps the fastest growing urban environmental amenity in the US today (Walls 2009). They represent a remarkable new sort of neighborhood commons that draws the attention of the public but has been largely overlooked by scholars. Moreover, significant conflict has arisen regarding the distribution of scarce park resources in parks like those in suburbs of Atlanta, Georgia (Yoo 2004), and among users of beach parks in California (Foster 2006). Yet the scholarly research on dog parks is scant. As policy-makers and urban planners attempt to design and implement sustainable and livable cities and increase the density of urban living, dog parks are becoming an increasingly important amenity for park officials, urban planners, and policy-makers to consider. Dog parks are a recent addition to many urban parks. Beginning with the adoption of leash laws in many US municipalities in the 1980s, dog owners and off-leash activists began pushing for designated off-leash areas. The first officially sanctioned dog park, the Ohlone Dog Park, was opened in Berkeley, California in 1983, and 40 acres of the Marymoor Park in Redmond, Washington were set aside in the 1980s to create a dog park (Krohe 2005). Throughout the 1990s, dog parks grew rapidly in number, and the online database doggoes.com lists over 2000 legal dog parks in the US (Dog Park USA Editor 2010). Despite the rapid growth in the number of dog parks, dog park facilities tend to be over-crowded and in high demand for expansion, with nearly 90% of park directors reporting that dog parks are increasing in popularity (Krohe 2005; Walls 2009). Increasingly, dog parks have moved from a controversial topic promoted by grassroots activists and dog enthusiasts, to entering the mainstream planning process for urban planners and parks and recreation department officials (Nowlin 2006; Walls 2009). Spending in the “pet economy” (buying, feeding, and caring for pets) doubled from 1994 to 2004 (Schwarz et al. 2007). With 65 million dogs owned in the US in 2002 and a pet economy reaching $41 billion in 2007 in the US, dog-related demands appear to be climbing. While the booming pet economy is one trend that augurs increased use and demand for dog parks, changing living patterns in the US also drive dog park demand. Since 1990, Americans have increasingly demanded “smart growth” (e.g. better open space, walkable neighborhoods), especially in urban areas (Haughey 2003). Population growth in urban cores couples with declining homeownership rates (down to 65.9% in 2011 from 69.2% in 2004), leaves dog owners searching for space for their dogs. Of particular interest here is the controversy and collective action problems faced by those governing this emerging type of urban environmental resource. This article discusses dog parks within the context of an emerging literature of the New Commons. We draw upon a recent survey of dog park users from a dog park in Atlanta, Georgia to develop a better understanding of how successfully this common pool resource (CPR) is governed and how lessons from the CPR management research program apply to these parks. We test the relationship between the perception of effective dog park management by users, as informed by CPR theory, and desirable outcomes such as reported donations to the park, volunteerism at the park, and the perception of community by park users. Aside from the introduction of dog parks as an emerging type of CPR, our empirical findings allow us to test whether (perceptions by users of) the operation of key CPR governance design principles from Ostrom (1990) predicts behaviour consistent with and perceptions of a robustly managed commons. These tests of basic CPR theory at the individual-user level offer support for the importance of these design principles, but also raises questions about how Ostrom’s principles apply to this new type of CPR and to urban greenspaces more generally. We expect to see if (variation in the perceived intensity of) the design principles can explain (variation in) the experiences in overcoming collective action problems – at an individual user level. We argue that dog parks represent a new and interesting CPR and that, at least for one major dog park, robust governance occurs despite lacking a few of Ostrom’s design principles. Furthermore, we observe a self-reinforcing mechanism whereby the users who perceive the design principles at work also tend to contribute more to maintaining the commons. The article proceeds as follows: First, we review literature discussing the New Commons and the Neighborhood Commons, emphasizing the extent to which dog parks fit with traditional conceptions of CPRs. Second, we define dog parks and provide a typology for the variety of dog parks that exist. Third, we detail background about a major dog park in Atlanta and describe the characteristics of its users using a dataset from a survey administered to dog-park users and existing data from other sources. Finally, we discuss these characteristics within the context of Ostrom’s management recommendations for CPRs and the implications for the governance of dog parks. Dog parks fit into an emerging literature focusing on the New Commons. Charlotte Hess defines the New Commons as “shared resources… without pre-existing rules or clear institutional arrangements” (Hess 2008, 1) and proposes a broad definition of a commons as “a resources shared by a group where the resource is vulnerable to enclosure, overuse, and social dilemmas” (Hess 2008, 37). This has been broken down into a variety of subcategories of commons research that includes the Cultural Commons, the Medical and Health Commons, The Knowledge Commons, the Global Commons, Infrastructure Commons, Markets as Commons, and the Neighborhood Commons, in addition to the Traditional Commons (Hess 2008). The Neighborhood Commons, as defined by Hess, “incorporate both urban and rural commons where people living in close proximity come together to strengthen, manage, preserve, or protect a local resource” (Hess 2008, 16). While a wide variety of issues can be examined or have been identified as commons, Hess’ list of research of the Neighborhood Commons includes parks and playgrounds (Delehanty 1992), brownfields (Clapp and Meyer 2000), sidewalks, streets, parking and public space (Abu-Ghazzeh 1998; Epstein 2002; McGovern 2002; Kettles 2004; Anjaria 2006; Blackmar 2006; Cooper 2006), home owner associations, housing and homelessness (Headington 2003; West and Morris 2003; Mitchell and Staeheli 2006), urban enclosure (Lee and Webster 2006), local security issues (Krebs et al. 1999), noise pollution (Illich 1983), community gardens (Linn 2008), and street trees (Steed and Fischer 2007). Within this extensive literature, most do not specifically refer to the “Neighborhood Commons”, but rather, examine collective action problems at a neighborhood level, with an eye towards improved governance of a shared resource. Dog parks fit closely into the neighborhood model of the commons due to the shared nature of the resource, the management of the resource, and the potential for physical degradation due to congestion, overuse, and the difficulties in maintaining safe conditions for the users. The sustainable operation of dog parks typically entails successfully addressing the collective action problems inherent in governing them. Dog parks can readily become overused, resulting in either congestion or degraded park infrastructure. Even for dog parks not threatened with physical degradation or congestion, other collective action problems arise in maintaining safe conditions for dogs and for humans. The establishment and enforcement of rules to manage these commons offer excellent examples of local environmental governance and provide a unique laboratory to study the governance of contested urban green space. In traditional Common Pool Resource (CPR) theory, CPRs share two attributes of importance for economic activity: it is costly to exclude individuals from using the resource, and the benefits consumed by one individual subtract from the benefits available to others (Ostrom et al. 1994). While the shared nature of dog parks as a Neighborhood Commons highlights the institutional challenges in managing them, several characteristics of dog parks are not perfectly aligned with the traditional understanding of CPRs as non-excludable and rival resources, and may slightly depart from Hess’ definition of the New Commons as resources without pre-existing rules or institutional arrangements. In the strictest sense, dog parks, as a resource, may be considered excludable. In fact, most dog parks have a fence, though in most cases, the fence exists to keep dogs in and provide safe conditions for other users of the park, rather than to exclude users from accessing the resource. Nevertheless, consistent with Ostrom’s characterization of CPRs, in most circumstances it would be prohibitively costly to exclude people from dog parks, due the need for additional staff or technology designed to keep potential users out and to enforce rules. Dog parks may also be non-rival, or non-subtractable, under conditions where crowding is low and the owners are responsible. Dog parks become rival under conditions where conflicts between dog owners (or between dogs) exist, where physical infrastructure or environmental quality deteriorates due to overuse, when rules are unenforced, or when facilities are not maintained. These are not uncommon circumstances, and dog parks generally rely on the self-enforcement of rules by users. Dog parks may also be rival with other uses for scarce park space. In addition, dog parks’ rules may not be perfectly aligned with Hess’ definition of the New Commons. Dog parks likely have pre-existing rules or institutional arrangements, but these institutional arrangements, we assume in the institutional analysis tradition, drive socio-ecological outcomes including the environmental quality of the dog parks and conflicts between the users. While many dog parks have posted rules, they generally lack formal institutional arrangements to monitor or enforce those rules. While the relationship of dog parks to CPRs is not perfect, we believe that conceptualizing dog parks as CPRs is helpful for understanding their attendant management challenges. The governance of these commons share many characteristics with CPRs and the New Commons, and we explore the extent to which dog parks are managed in a manner consistent with CPR management theory and where management challenges may depart from traditional CPR theory. The wide variety of institutional forms for governing dog park commons observed in the US suggests a rich context for deeper exploration of these issues. As discussed in more detail below, private, public, and quasi-public management forms are common for dog parks, just as stories of “failed” dog parks seem to be fairly common as well. Elinor Ostrom (1990) offers a useful theoretical framework for understanding how dog parks might be sustainably managed as common-pool resources. Her pioneering work on understanding robust institutions for CPRs provides the lens through which we assess the management of a major dog park in Atlanta. Ostrom introduced a set of “design principles” associated with robust CPR governance institutions. These eight design principles are neither necessary nor sufficient, but are highly predictive of commons that have overcome the “tragedy.” [For further discussion, readers are directed to Ostrom (1990, 2005)]. In brief, Ostrom’s design principles include matters of appropriateness of rules and rulemaking, dispute resolution, monitoring, and legal recognition. Table 1 lists the eight design principles and applies them to dog parks. Applying these principles to an environmental resource such as dog parks is straightforward. Degraded infrastructure in the dog park (e.g. fences, water fountains) and uncollected dog feces pose obvious collective action problems. Similarly, the creation and enforcement of rules governing park use and dog discipline can be thought of as (second-order) collective dilemma in their own right (Ostrom 1990, 42–43). How a particular dog park is able to handle issues such as rules and rulemaking, Ostrom’s approach would suggest, is critical to its long-term sustainability. When dog owners come into conflict, how are these disputes resolved? Are the rules and governing institution legally recognized to have authority? Are there monitors and are they accountable to dog owners (or are they the dog owners themselves)? Are there graduated sanctions for rules violators? Following Ostrom’s argument regarding the sustainability of a resource, we suggest that the sustainability of a neighborhood commons depends on users’ voluntary contributions – both financial contributions as well as volunteering time and labor – to overcome the ongoing collective action problem in maintaining the resource. Establishing a sense of community is both an outcome of successful CPR management, and can contribute to the development of social capital, trust, and the successful management of a resource (Grafton 2005). Further, we expect that these desirable behaviours and attitudes lead to successful collective action yet vary from user to user in a way that depends on individual user characteristics as well as the perceptions by users that the resource is being managed successfully. If users feel more connected to the park and if users believe that they are active participants in the management of the resource, we expect them to contribute to the successful operation of the park, including the donation of time and money towards the park’s upkeep. We operationalize the successful management of the resource by measuring the congruence between Ostrom’s institutional design principles and users’ perceptions of the governance of the resource. Dog park users were asked about whether sanctioning and monitoring exists at the park, whether they have input regarding rules, and whether they hold others accountable for rule violations. We expect that users who perceive more congruence between park management and successful CPR design principals will exhibit a greater likelihood to contribute to the maintenance of the park and perceive the strongest community development. While most existing work has focused on formalized dog parks, endorsed by cities, with specific rules and regulations, many types of dog parks exist. We identify and describe several types of dog parks in this section. Most municipal dog parks are fenced in areas, usually provide seating for humans, and possibly contain a water source for dogs. They may be gravel, grass, or a variety of other types of surfaces and can range in size from <1 acre to >80 acres (4,000–324,000 square meters). Frequently, the park is divided for dogs of different sizes. 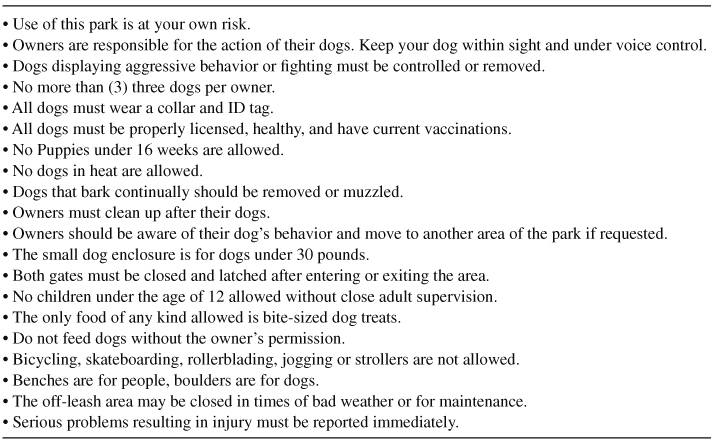 They also contain very specific rules pertaining to dog and owner behaviour while using the dog park. While the dog parks are fenced, no monitoring exists regarding who enters, and fees are not paid, making these parks more akin to an open-access resource than a toll good. While there is a wide variation in the rules existing at the dog park, typical rules may include that dogs should have had all their shots, female dogs may not be in heat, and owners may not bring in more than three dogs at a time. Dogs should not be aggressive, owners must pick up after the dogs, and dog owners must carry a leash (Krohe 2005). Funding for these parks is generally provided by the city itself, or is sponsored by dog park associations, human societies, or other private donors. For example, the Piedmont Park Dog Park, in Atlanta, Georgia, relies on donations to fund all dog-park activities, and the park is managed by the Piedmont Park Conservancy, a non-profit organization. The park contains two enclosures: one for small dogs under 30 pounds (13.6 kg); one for large dogs. It is fenced in, has a water spigot, and benches for owners. Rules are posted at the park, but there is no formal enforcement authority (see Table 2 for a list of Piedmont Dog Park rules). While most dog parks run and organized formally within urban parks are fenced, they contain few provisions for monitoring or enforcement of rules. In contrast, some municipal dog parks contain restrictive rules for entry including membership. In these parks, verification procedures may be required to ensure that dogs are licensed and up to date on shots and vaccinations before using the dog park. Fees may be charged to dog owners, and dogs may be screened prior to being allowed to enter the park (Krohe 2005). In some versions, dog park management is outsourced to a dog park association (Krohe 2005). Typical fees range from $10–$80 per family (Dog Park USA Editor 2010). For example, the Karst Farm dog park, in Bloomington, Indiana, requires a $50 annual fee, per family, for all dogs. Dogs must be up to date on vaccinations, and members receive a key to the fenced-in enclosure. The park is run by Monroe County Department of Parks and Recreation. Many multi-family units of housing contain dog run areas for tenants and condominium owners. Green space for dogs can be found near or on the grounds of condominium complexes, apartment buildings, and homeowner associations. These facilities are generally smaller, and are limited only to those who are members via the homeowner association or condo association. These areas do not likely appear in official counts of dog parks. In many cities, dog owners allow their dogs to congregate and run off-leash in a variety of open spaces, and municipal officials appear to tolerate these “unofficial” dog parks. These dog parks may or may not be fenced, and likely do not contain the same types of facilities as more official dog parks. While these parks do not have specific lists of rules, dog owners may be more likely to use social norms to maintain order. These dog parks are most likely unaccounted for in official databases. Some dog parks are privately owned and are managed similarly to municipal dog parks that require a permit. These dog parks are generally paired with other pet-related services such as boarding, grooming, and training (Dog Park USA Editor 2010). For example, on an 11 acre (44,500 square meter) space, the Columbus Dog Park provides an agility course, swimming area, running trails, and a dog wash area, as well as discounts on boarding. The dog park charges $395 annually, per family, for up to four dogs. In order to better understand the users and impacts of dog parks, we conducted a survey of dog park users of Piedmont Park, in Atlanta Georgia, in June and July 2008. Piedmont Park is three miles from downtown and is among the city’s largest and most intensively used parks. The park has hosted one of the city’s largest off-leash dog parks since 2002. The park, including the dog park, is managed by the Piedmont Park Conservancy, a private non-profit organization that has raised funds, maintained, and managed the park since 1992 in partnership with the city government. This private/public arrangement, similar to that for Central Park in New York City, is fairly common for major parks in Atlanta. In the following section we give background information on the Piedmont Park Dog Park, discuss the survey collection process, present descriptive statistics of the sample, and discuss implications of survey findings for overcoming collective action problems in the dog park. The creation of the Piedmont Dog Park resulted from the continuous violation of leash laws in Piedmont Park, which convinced park officials of the need to establish an off-leash dog area in order to improve park safety for park users. The Piedmont Park Conservancy moved, in May 2002, to obtain a 1 year trial variance in the city’s leash laws in order to provide a fenced-in off-leash dog area, as the first public dog park in Georgia, and one of the first in the Southeastern US. Despite initial opposition from area residents and city officials, the dog park was awarded a permanent variance by city council in July 2003 to become a permanent fixture. The park continues to exist as a variance to the city’s leash laws, and the city council could revoke the variance in the future. Piedmont Park receives approximately 2.5–3 million visitors a year, and about a fifth of these users claim to use the dog park. It is the city’s major, and for a time only, public off-leash dog park. In order to design the park, a committee from the Piedmont Park Conservancy’s professional staff examined already established parks in Seattle, New York, and Washington, DC. Conservancy officials attempted to emulate the best practices in major city parks. Since the park was founded in 2002, the rules have not changed (see Table 2 for list of formal Piedmont Dog Park Rules). The park was designed to take advantage of existing chain link fencing in order to minimize costs. The initial park had few amenities – consisting largely of a water hydrant, benches, and mulch and was a little smaller than 2 acres, though in 2010 it was greatly expanded with improved watering stations, evening and nighttime lighting, a separate dog park for small dogs, restrooms, concessions, and shade trees. The dog park is fully nested and managed within the Piedmont Park Conservancy’s management of Piedmont Park. When the park was founded, the park relied heavily on the Leash-Free Alliance, a group of volunteers that participated in policy-making and decision-making related to the dog park, but once the city granted the leash ordinance variance and the park was established, the Alliance became much less active and involved. There are no city funds for maintenance, and maintenance of the park relies heavily on volunteer labor. The dog park is funded by the Conservancy, which uses fundraisers and donations in order to keep the park operational. Day-to-day operations of both Piedmont Park and the dog park are handled by the Conservancy’s professional staff, and are overseen by the Conservancy’s board of directors. Rules, policies, and procedures are determined by the Conservancy’s professional staff. The Conservancy and users consider the dog park a self-policing venue that relies predominantly on peer pressure. Disputes and security problems – especially with aggressive dogs – occasionally attract the attention of the security guards, and disputes can lead to Conservancy staff to become involved. The Conservancy employs security monitors to maintain the safety of park conditions, but there are no monitors exclusively assigned to the dog park. The monitoring and enforcement of rules depend primarily on the self-enforcement by park users. Very rarely, violators of rules are “counseled” by park staff to muzzle their dogs or to not return to the park, but most of the time, disputes are resolved by park users. While the Conservancy has considered permanent security at the dog park, it has been deemed prohibitively expensive. Indeed, the park can be considered open access, as no fees are charged, and park staff has deemed it prohibitively expensive to even monitor who enters the dog park. The survey was administered to 298 users of Piedmont Park during June and July, 2008. At the time, it was the only official off-leash dog park in the City’s park system. Two students gave surveys during several periods of time, including after work, mid-morning, and lunchtime, on 14 different days spread over weekdays and weekends. They reported no refusals to participate in the survey (perhaps due to the “captive audience” and friendly nature of the park) and were generally able to survey all of the users in any given visit to the dog park. Sampling continued until the survey administrators reported two consecutive days of surveying with no new respondents. In the following sections, we describe the findings of the survey and provide aggregated comparison figures of the four census tracts bordering the park. A copy of the survey instrument is included in the appendix. 4.3. Who visits the dog park? Dog park visitors at Piedmont Park are nearly evenly split by gender and marital status. Fifteen percent have children, and they tend to be young and affluent. Compared to the rest of the neighborhood, they are more likely to be female, younger, married, have children, and have a higher household income. These sample means are all statistically significantly different from the neighborhood averages from the 2000 Census at the α=0.01 level. The popularity of the dog park with wealthier families with children is not surprising in light of Schwarz et al. (2007) (see Table 3). 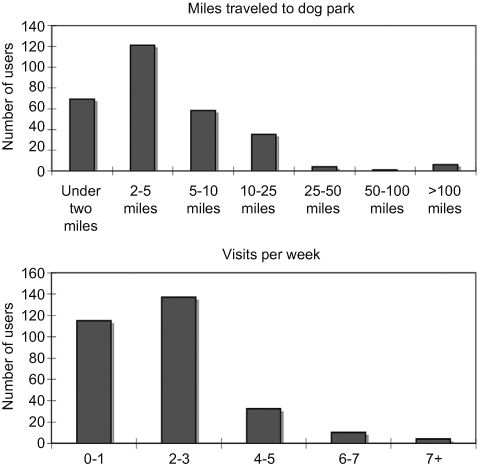 Dog park users come from a variety of places (see Figures 1 and 2). The median user travels 3.8 miles (6.1 km), while the average distance traveled is 15.5 miles (25 km) – due to a large amount of dog park users from suburbs of Atlanta, or even far outside of Atlanta. The sheer size and popularity of the Piedmont Dog Park, coupled with so many users traveling from distant homes, makes this dog park particularly interesting to study. Seventy-nine percent of users drive to the dog park, while 21% walk or run. Users report a median travel time of 11–15 minutes, and visit the dog park two to three times per week. Users will stay on average between 35 and 45 minutes per visit. Consistent with our expectations, frequency of visits is significantly correlated with reported importance of locating near the park (r=0.14, p=0.02) and importance of park accessibility (r=0.27. p<0.01). Users who drive (walk) took fewer (more) trips and stayed longer (less). People visit the dog park for a variety of reasons including to exercise their dogs, socialize their dogs, to meet other people, and to socialize with their kids or grandkids. Eighty-six percent of dog park users reported that they feel a sense of community with other dog park users. Those who visit the park more frequently (r=0.25), stay longer during visits (r=0.11), visit the park on weekdays (r=0.17), and made locational decisions based on the presence of the park (r=0.15) are feel a stronger sense of community based on their interactions with the park. Table 4 summarizes the survey results for a set of 7-point Likert-scale questions. Evidence from the dog park survey suggests that proximity to the dog park may play a role in housing decisions and who attends the park. Of the 296 respondents to this question, 39.6% agreed that dog park access was a factor in their living and locational decision. A total of 73.3% reported that the dog park was easily accessible. Demographic factors were correlated with the role that the dog park played in living decisions. Respondents who were younger (r=0.16), did not have children (r=0.16), and were of lower income (r=0.15) were more likely to have based their living decision based on the presence of the dog park. The sense of community in the dog park may not translate into community service or volunteer work. Only 5.7% of users report that they volunteer time in the park; however, 23.3% of users report that they donate money to the park, and 24.7% of users report that they are “involved in the upkeep or maintenance” of the park. These characteristics may be correlated with whether or not the users feel a sense of community. Feeling a sense of community is correlated with contributing to the upkeep of the park (r=0.18) but not significantly with donating time (r=0.09) or money (r=0.08) to the park. User characteristics and responses covary in interesting ways. Table 5 shows a correlation matrix for select variables. Ten different 7-point Likert-scale questions are shown in Table 5 – the same nine variables from Table 4, plus a question about the importance of locating near the dog park. The correlation matrix also includes measures for income and trip frequency. Overall, Table 5 indicates remarkably sensible results. 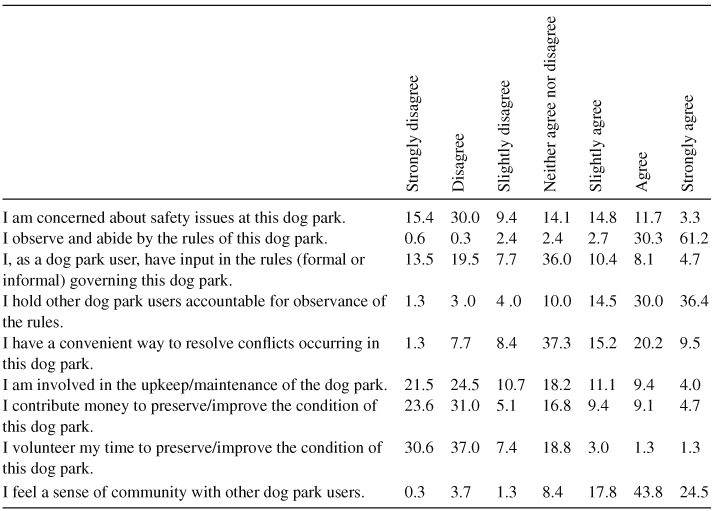 The measure of the dog park influence on location choice is significantly correlated with all of the other Likert-scale questions in the survey (except for following rules, which had little variance) and helping with maintenance. More generally, most of the Likert-scale questions about the dog park are significantly correlated. Those who donate money also tend to volunteer, and they tend to be wealthier and generally more involved in the park. Volunteers tend to help maintain the park, even more than cash contributors. Frequent users felt more community and volunteered more time and effort to the collective good. This finding reflects a bit of congruence between the beneficiaries and those who bear the costs of maintaining the dog park (consistent with Ostrom’s principle 2). The user survey reveals perceptions about compliance and enforcement of rules that directly reflect the design principles. Importantly, there is a great deal of variation in responses to most of these questions. (Unsurprisingly, the one exception to this arises when 92% of all users agreed or strongly agree that they abide by posted park rules.) While dog parks have posted rules, it is often unclear who enforces rules, if they are enforced at all. Only 23% of respondents agreed that they have some input regarding rules (Ostrom’s principle 3), suggesting that rule-making at the park is not viewed as a participatory process. Those who feel a sense of community with the park are more likely to feel incorporated in the rule-making and enforcement process (r=0.14). Evidence suggests that despite not having formal park monitors, the dog park may be effectively self-governing. Figure 3 summarizes these results. Eighty one percent of users suggest that they hold other users accountable for the rules (principle 4), though only 45% believe that there is a convenient way to resolve conflicts at the park (principle 6). The lack of low-cost conflict resolution mechanisms – relying so heavily on peer pressure – is reflected in the survey responses. Feeling a sense of community is significantly correlated with holding others accountable for the rules (r=0.19), and feeling that there is adequate ways to resolve conflicts (r=0.23). Nevertheless, 43% of users suggest that dog aggression at the park is a concern and 31% agree that safety is a concern in the dog park. Still, only 27% of users want an assigned monitor in the park, and even less would be willing to pay a $5 monthly fee to fund this monitor. Only 15% of users thought that users could be sanctioned (principle 5), and most responses suggested that sanctioning was entirely self-managed by responsible owners. These responses offer mixed signals about the effectiveness of monitoring and conflict resolution. Ostrom’s other design principles map onto this case well. The boundary rules are clear (principle 1), as the dog park is spatially isolated from the rest of the park. The public dog park is available to anyone during regular park hours. The official recognition (principle 7) of the Conservancy by the city government as manager of the dog park legitimates the dog park’s formal rules and the generally self-governed nature of this dog park relies on the users’ norms for the bulk of enforcement. The Leash-free Alliance of Piedmont Park (LAPP) works closely under the Conservancy as a sort of specialized, nested organization (principle 8) that supports the maintenance of this common-pool resource. To date, they have raised over $50,000 and volunteer labor to improve the park facilities (e.g. add trash receptacles, plant trees). The survey responses confirm how the users mobilize support for maintaining the dog park through donations to the dog park component of Piedmont Park. The Piedmont Dog Park management corresponds closely with some of Ostrom’s design principles, (1, 2, 4, 7, and 8), less well with others (3, 5, and 6). This mixed assessment should not be taken to indicate that this dog park is at risk or unsustainably managed. If anything, it is quite robustly governed, as it has expanded and improved its facilities in the years following the survey (and during a severe recession). This mixed assessment follows in part from the variation in the users’ experiences in and attitudes towards the park. Appreciating roughly 300 users’ differing perspectives also affords us the opportunity to test whether the (perception of the) presence of these key design principles for an individual can predict that individual’s contribution to maintaining the CPR or their perception of a healthy commons. Clearly, not all users see the design principles at work equally, and not everyone is contributing to the maintenance of this CPR. We exploit this variation to see if users’ perceptions of dog park governance predicts their (self-reported) behaviour toward solving collective action problems. We expect to see that when users perceive the principles at work, they will also be more likely to contribute to the park and to see a stronger commons. To test this, we estimated a series of ordinary least squares (OLS) regressions. Parallel models are estimated for four alternative dependent variables: volunteer time, donate money, sense of community, and help to maintain. Each of these variables are Likert-scale measures and are predicted using another set of Likert-scale measures corresponding to four particular design principles (conflict resolution, input on rules, holding others accountable, available sanctioning). The models are estimated for the 283 respondents (with complete data) weighted by their trip frequency.2 Each model is also estimated with three control variables: income (which is interesting in its own right and particularly interesting for the financial donation model) and two measures of use intensity (trip frequency and an indicator for whether the user usually visits on weekends). The results in Table 6 indicate a few patterns among the variables, despite not explaining very much of the variance in the dependent variables. For the control variables, it seems that weekend visitors contribute less to the maintenance of the commons, but feel no less sense of community. Frequent visitors tend to contribute more, except for money, and enjoy a stronger sense of community. User wealth predicts donate money, as expected, and interestingly predicts less agreement with notions of sense of community or helping to maintain the dog park. More importantly, we see strong relationships between these indicators of overcoming collective action problems and the four variables corresponding to design principles. Across all models, feeling involved in rule-making positively and significantly predicts more collective action or stronger sense of community. Users who think there are sanctions for rule-breakers show less voluntarism (in time or money), but they exhibit no significantly different sense of community. Those who hold others accountable tend to agree more with donating money, feeling a sense of community, and helping to maintain the park. Surprisingly, those users are not more likely to volunteer time given the other controls. Finally, perception that low-cost conflict resolution is available predicts stronger sense of community and has a weaker relationship with volunteer time, but does not help predict monetary donations or help with park upkeep. The OLS regressions are presented in Table 6. The Piedmont Park dog park offers a mixed case of congruence between the characteristics of the park and the institutional design principles discussed above. Users struggle with aggressive dogs and rule compliance, and many of them feel uninvolved in rule-making and face costly dispute resolution mechanisms. Despite falling short on several of Ostrom’s design principles, this dog park seems to have a healthy operation. Self-reported compliance is nearly universal. Few users felt a need for improvements in monitoring, especially from an external authority. Dog park owners favored self-governance of the dog park, even if imperfect. This may change as the increasing demand for the dog park places it under further strain. Or users may modify operational rules to adapt to the change. The dog park may be helpful in establishing community, social capital, and volunteerism. While the survey did not specifically ask about social mixing, making friends, and other forms of building community, it was clear from several free-response questions that the dog parks provide a useful place for people to meet each other and to interact with those they might not have come into contact with. These lessons are likely applicable to other neighborhood commons and their governance. The results of the individual-level analysis suggest that variation in users’ perceptions of particular design principles predicts their pro-social behaviour and their sense of community in the dog park. Generally, three out of four of the design principles are significantly related to overcoming the collective action problems. But these relationships are complex, even in the simplified framework of Table 6. For instance, the presence of sanctioning mechanisms seems to undermine voluntarism. Perceived involvement in rule-making, on the other hand, promotes more voluntarism, maintenance, and sense of community. This supports the general idea that design matters. The presence of these design principles among users, aside from making the park work well, also spurs individuals to contribute and participate in the park. This is a self-reinforcing system that links stakeholder participation to institutional effectiveness. Stakeholders contribute because they see a successful institution; the institution is successful because stakeholders contribute. Thus, while the Piedmont Dog Park represents a self-governing commons, it also highlights the chicken-and-egg nature of sustainable commons governance. This particular commons indeed started successfully and arguably had little public input regarding rules. The dog park’s history points to the necessity of having a core group of people who reinforce norms, monitor, and sanction. If most users were infrequent, weekend visitors, we might expect the dog park to be more chaotic, have less enforcement of rules, and more failure of collective action. Instead, we observe a rich case with users contributing to maintain the commons in different ways. Those with income donate money, while those who visit frequently volunteer time and participate in the enforcement mechanism of the park (self-policing). Those who believe they have input regarding the rules are more likely to visit frequently and are more likely to contribute to the maintenance of the park. Although it may be imprudent based on just one detailed case study, these findings might suggest some lessons for governing other dog parks. Given our findings, successful dog parks appear to benefit critically from (a) clear boundaries, (b) congruence between beneficiaries and maintenance costs, and (c) formal recognition by government. 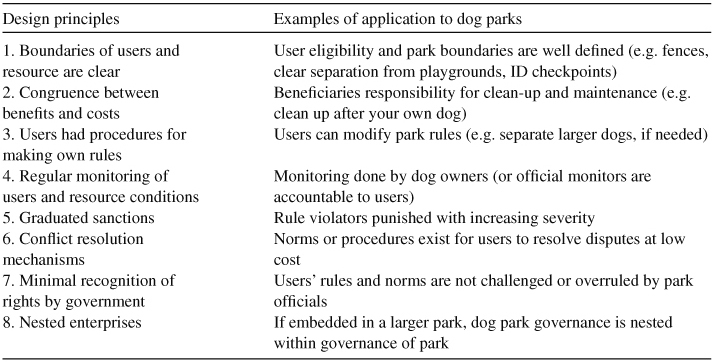 Easy monitoring by users and nesting the dog park governance within broader park governance also effectively facilitates clean-up and norm enforcement. The lack of rule-making opportunities or low-cost conflict-resolution processes for users do not appear to be vital. Perhaps the most important lessons from Piedmont Dog Park’s ongoing success is to grow slowly, allow flexibility in how users can contribute to ongoing collective action, and develop a core group of active users who enforce norms and informally perform other management roles. The presence of these users appears to attract more of the same. Of course, establishing such a stable core “from scratch” may be challenging in some circumstances. The informal methods of rule enforcement and sanctioning in this park provide a useful laboratory in which to explore individuals and behaviour within formal and informal institutions. While this survey provides a useful snapshot of who uses a dog park, much more could be learned regarding the impacts a dog park has on communities and individuals. Not enough is known to test specific hypotheses about the value of dog parks more generally and the impacts of different institutional arrangements on user experience. While recognizing the large variety of dog parks and their governing institutions, the Piedmont Park dog park provides an interesting case that highlights several key features of dog parks as a New Commons. Even though legal recognition of this dog park exists, mechanisms to exclude others and enforce rules are costly or non-existent. Collective action problems in monitoring, sanctioning, resolving conflicts, and adapting the rules exist, in principle at least. In practice, in this dog park, infractions and conflicts appear relatively rare. 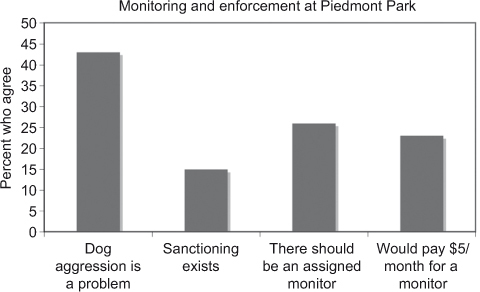 The informal governance of the dog park, via monitoring by the users (dog owners) themselves and via social pressure when the “sense of community” is quite high, is quite effective. Whether this institution is robust over time and resilient in the face of growth in use of the dog park remains to be seen. This sort of New Commons, and the diverse governance approaches taken, raises more questions than this one case study can address. Clear directions to proceed with research include attempting to establish a clearer measure of the importance of neighborhood dog parks. This involves estimating an economic value of dog parks and understanding the impact they have on local communities. From a theoretical perspective, it would make sense to compare institutional arrangements of multiple dog parks and how these institutional arrangements impact rule formulation, and monitoring and sanctioning behaviour. The case of dog parks also raises important questions about how park managers and planners balance competing uses for urban greenspace, as dog parks are generally incompatible with many other popular park uses. 1Information in this section is derived from communication with Piedmont Park Conservancy Staff between August and September, 2011. 2The results are robust to an unweighted analysis and to omission of the control variables. The primary difference is in the increased precision for a few coefficient estimates in the frequency weighted models. These qualitatively similar results in the other models are available upon request. Abu-Ghazzeh, T (1998). Children’s Use of the Street as a Playground in Abu-Nuseir, Jordan. Environment and Behavior 30(6): 799–831. Anjaria, J. S (2006). Street Hawkers and Public Space in Mumbai. Economic and Political Weekly 4(21): 2140–2146. Blackmar, E , ; Appropriating “the Commons”: The Tragedy of Property Rights Disclosure. In: Low, S and Smith, N eds. , editors. The Politics of Public Space. New York: Taylor and Francis. 2006. Clapp, T. L and Meyer, P. B , . Brownfields and the Urban Commons: Common Property Frameworks in Urban Environmental Quality. Louisville, Kentucky: Center for Environmental Policy and Management. Kentucky: Institute for Environment and Sustainable Development, University of Louisville. 2000.
Cooper, D (2006). ‘Sometimes a Community and Sometimes a Battlefield:’ Comedic Public Sphere to the Commons to the Commons of Speakers’ Corner. Environment and Planning D: Society and Space 24(5): 753–775. Delehanty, R. S , . San Francisco Parks and Playgrounds, 1839–1990: The History of a Public Good in One North American City. Ph.D. Dissertation. Cambridge, MA: Harvard University. 1992. Epstein, R (2002). The Allocation of the Commons: Parking on Public Roads. Journal of Legal Studies 31(2): S515–S544. Foster, L , . Dogs on the Beach: A Review of Regulations and Issues Affecting Dog Beaches in California. California Research Bureau. 2006. Grafton, R. Q (2005). Social capital and fisheries governance. Ocean & Coastal Management 48(9–10): 753–766. Haughey, R , . The Case for Multifamily Housing. Washington, DC: The Urban Land Linstitute. 2003. Headington, L , . The Other Tragedy of the Commons: Redevelopment of Denver’s South Platte River and the Homeless. Ph.D. Dissertation. Boulder, Colorado: University of Colorado. 2003. Hess, C , . Mapping the New Commons. Paper read at International Association for the Study of the Commons. Cheltenham, UK: University of Gloucestershire. 2008. Illich, I (1983). Silence is a Commons. The Coevolution Quarterly 40: 5–9. Kettles, G. W (2004). Regulating Vending in the Sidewalk Commons. Temple Law Review 77(1): 1–46. Krebs, C, Sever, B and R Clear, T (1999). Disparate Sentencing: A Tragedy of the Commons. Corrections Management Quarterly 3(2): 60–76. Lee, S and Webster, C (2006). Enclosure of the Urban Commons. GeoJournal 66(1–2): 27–42. Linn, K , . Building Commons and Community. Oakland, CA: New Village Press. 2008. McGovern, F (2002). The Tragedy of the Asbestos Commons. Virginia Law Review 88: 1721–1756. Mitchell, D and Staeheli, L , ; Low, S and Smith, Smith , . The Politics of Public Space. New York: Taylor and Francis. 2006. Clean and Safe? Property Redevelopment, Public Space, and Homelessness in Downtown San Diego. Ostrom, E , . Governing the commons: the evolution of institutions for collective action. Cambridge, UK: Cambridge University press. 1990. Ostrom, E, Gardner, R and Walker, J , . Rules, Games, and Common Pool Resources. Ann Arbor, MI: University of Michigan Press. 1994. Walls, M , . Parks and Recreation in the United States: Local Park Systems. Washington, DC: Resources for the Future. 2009. West, M and Morris, E (2003). The Tragedy of the Condominiums: Legal Responses to Collective Action Problems after the Kobe Earthquake. American Journal of Comparative Law 51: 903–940. Traveling to the dog park. Monitoring and enforcement at Piedmont Dog Park.